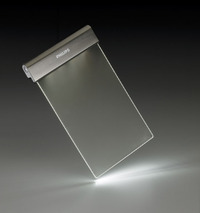 " Royal Philips Electronics (NYSE: PHG, AEX: PHI) announced today that it will launch a new solar powered reading light, which enables people to both read and write after dark. The light ? called ‘My Reading Light’ ? was developed specifically for the education sector in Africa and will allow a new generation of school children to continue with their homework after sunset. Today an estimated 500 million Africans live without electricity. For these people nightfall means either darkness or the flickering light of a candle or kerosene lamp. There are however many disadvantages of kerosene lanterns including health and safety risks, expensive oil-driven fuel prices, and the low light output which makes reading nearly impossible. 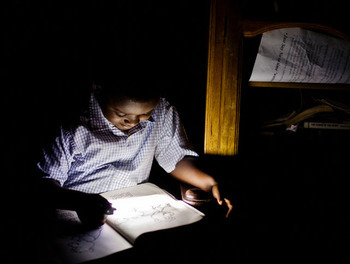 As a result, life in many parts of Africa practically comes to a halt at sundown, including children busy with their homework. Solar powered lighting solutions can make a true difference here. ”As part of Philips’ broader drive to improve people’s lives, Philips is committed to making affordable, high-quality, energy efficient lighting available to areas where it is most needed. Offering new LED based, solar lighting solutions offers a triple-win: the lives of people in Africa will be generally improved, LEDs result in a very low carbon footprint and companies offering the right solutions stand to gain.” says Rudy Provoost, Executive Vice-President and Chief Executive Officer of Philips Lighting. 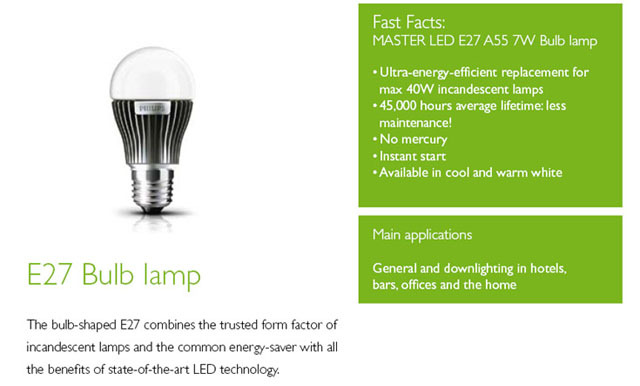 ‘My Reading Light’ provides high quality LED lighting. It is extremely lightweight and can be hand-held or placed over the page of a book, allowing the user to read or write. There is a choice of high/middle/low dimming settings. ‘My Reading Light’ has a built-in rechargeable battery providing between 3.5 and 9 hours of light depending on the light level selected. The reading light ? which we expect to launch in autumn this year-, will be available in two versions: a standard light and a slimmed down, low-cost version with a target consumer price of less than 15 US dollars. -----image(”My reading light”）: 同リリースより "